This window depicts the Visitation where the Blessed Virgin Mary visits St Elizabeth. The inscription reads " Erected to the memory of Ann Beard by her sister Mary". This window depicts St Peter as the first Pope seated on the Papal Throne holding the Keys of Heaven. The inscription reads " Erected by Caroline Smallwood in memory of Charles and Caroline Beech who were benefactors of the Church". This window depicts The Nativity. The inscription reads " Erected in the memory of Emma Plant by her beloved husband John Plant". This window depicts the Assumption of the Blessed Virgin Mary into Heaven. At the end of her earthly life Our Lady ascended into Heaven both in body and soul, and reigns there as Queen of the Saints. The Dogma of Faith was solemnly defined by Pope Pius XII in 1950. ​The window was donated by Mr & Mrs B. Smith. According to Dominican tradition, in 1206, St Dominic was in Prouille, France, attempting to convert the Albigensians back to the Catholic faith. The young priest had little success until one day he received a vision of the Blessed Virgin, who gave him the Rosary as a tool against heretics. While Mary's giving the rosary to St. Dominic is generally acknowledged as a legend, the development of this prayer form owes much to the followers of St. Dominic. The window was donated by someone who wished to remain anonymous. The " Morning Star" has always had a special application to the Blessed Virgin Mary. The Church interprets the verse in the Canticle of Canticles (vi, 9) as descriptive of Her: "Who is She that cometh forth as the morning rising, fair as the moon, bright as the sun?" The window was donated also by someone who wished to remain anonymous. In the lives and histories of the Saints and holy servants of God, we often read that they were privileged to behold, either in Heaven or on earth, great solemn Masses and celebrations in which Our Lord and Our Lady and the Saints took part. Not only on earth was Mary a " Singular Vessel of Devotion" , but by these visions we would seem to be informed that She joins in the prayers of Her servants on earth, and helps their devotions. This window was donated by Mrs J. Beech & Family. The lily is a symbol connected to both the Annunciation of Our Lady and Our Lord's Resurrection. A symbol of Our Lady's purity & innocence. This title is no doubt inspired by that text of the Canticle of Canticles: "Thy neck is as the tower of David; a thousand bucklers (small round shields) hang upon it, all the armour of valiant men". We do not need to be told what a great war it is, in which we need the defence of this strong tower, the Mother of God. It is the great battle between God and the Devil, between good and evil. This window was donated by the Brannon Family. According to Cardinal Newman, the Blessed Virgin Mary is called "Rosa Mystica", the Mystical Rose, because she is the Queen of spiritual flowers; and therefore she is called the Rose, for the rose is fitly called of all flowers the most beautiful. This window was donated by the Roberts Family. St Matthew writes in his Gospels that Jesus took Peter and James and his brother John with him and led them up a high mountain where they could be alone. There, in their presence, he was transfigured: his face shone like the sun and his clothes became as white as the light. Suddenly, Moses and Elijah appeared to them; they were talking to him. The window was donated in memory of James and Mary Beard. The more usable monogram of our Saviour is I H S which is the first three letters of the Greek translation of Jesus. This was constantly found throughout the Middle Ages. The monogram of Christ formed from the first two letters of that name in Greek (X and P) is the celebrated sign which appeared in the sky at noon to the Emperor Constantine and his troops and was later adopted by him on his standard. The monogram is sometimes called the Labarum as well as the Cross of Constantine. 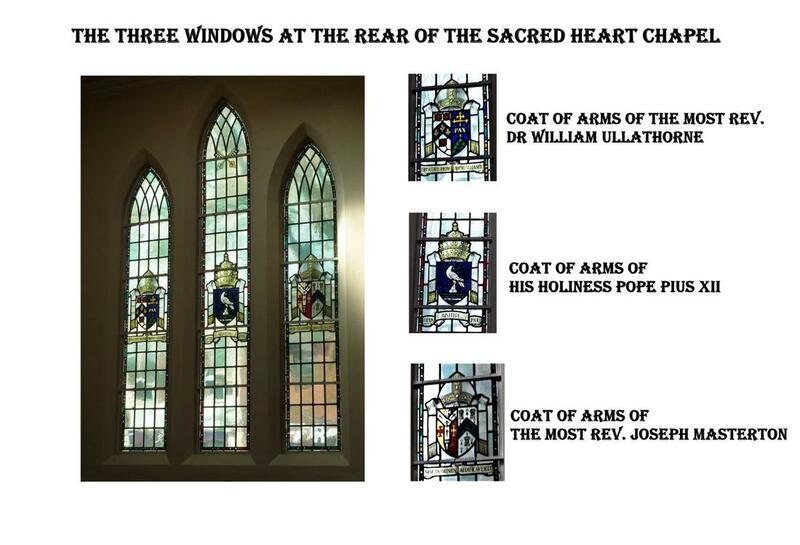 The window was donated by George Lawlor Snr. The remaining two windows, one depicting wheat and the other grapes, represent the bread and wine which is offered during Mass and become the Body and Blood of Jesus respectively. The one window (Wheat) was donated by Mrs B Harris while the other (Grapes) wished to remain anonymous. The Most Rev. Dr William Bernard Ullathorne was the first Bishop of Birmingham. He sang the Pontifical High Mass at the opening of St Peter's Church on 14th September 1869. His Holiness Pope Pius XII was in Office when the Church extension was completed in 1954. The Most Rev. Joseph Masterton was Archbishop of Birmingham at the time of the beginning of the Church extension. He counselled the extension of the Church and approved the finalised plans. Regrettably the Archbishop died on 30th November 1953 prior to the completion of the extension. The Windows in the Choir Gallery relate to St Patrick, the Patron Saint of Ireland. 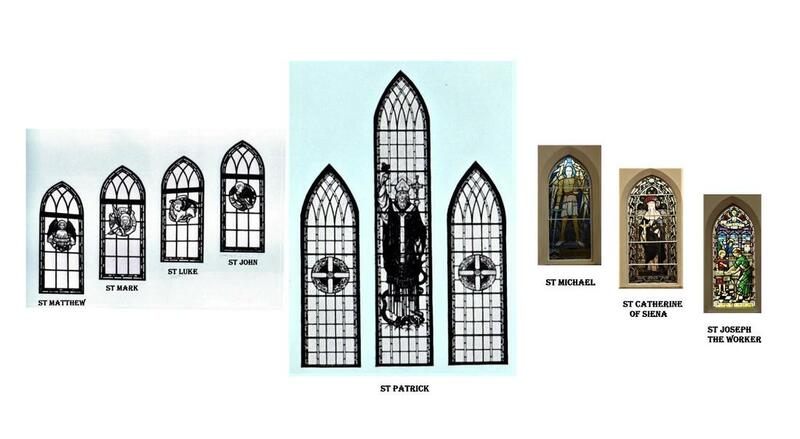 These three windows were donated by Mr John Collins in memory of his late Father, Mr Patrick Collins, the former Mayor of Walsall and fairground impresario. This window depicts a man which represents St Matthew who opens his Gospel by tracing the human descent of Jesus as the " Seed promised to Abraham". This window was donated by the Thomas Family. This window depicts a lion, the King of Beasts, which represents St Mark as he opens his Gospel with a declaration of divinity of Jesus Christ - "the beginning of the Gospel of Jesus Christ, the Son of God". This window was donated by someone who wished to remain anonymous. This window depicts a calf, the main victim of sacrifice under the Old Law, signifying that Jesus is the victim and priest of the New Law. This window was donated by Miss Magraret McNicholas, a former teacher at St Peter's School. This Window depicts a eagle flying to great heights which is appropriate for his Gospel showing two natures, human and divine in one person. "In the beginning was the Word, and the Word was with God, and the Word was God, and the Word was made flesh and dwelt amongst us". This window was donated by the Dolman Family. This window depicts St Michael the Archangel bearing his sword with a foot on a serpent signifying the defeat of Lucifer. The inscription on the base of the window reads "This window has been etched to commemorate the rebuilding of the Church by Rev. Michael J Walshe, Parish Priest, 1946 - 1967". This window depicts St Catherine of Siena (Catherine Benincasa) who at the age of six had mystic visions; she saw Guardian Angels protecting people. She knew that she wanted to live a religious life but her parents tried to dissuade her and influence her to marry. At the age of sixteen, she entered the Third Order of St Dominic. Her reputation for her visions and compassion spread quickly that people would flock to see and talk to her and many become converted. This window was retained from the Old Church (1869). This window depicts St Joseph working at his trade as carpenter. The inscription on the base of the window reads " Pray for the Soul of Fred Wootton who died 4th November 1957".